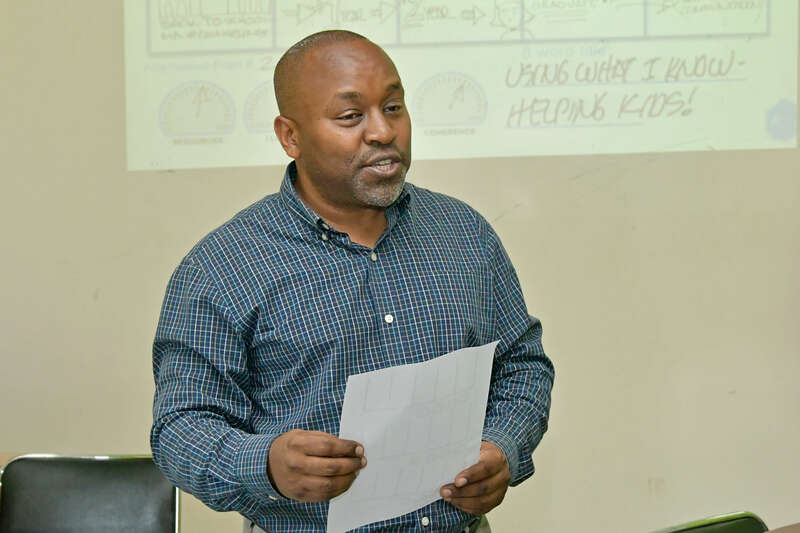 Dr. Peter Maribei, who coordinates the Global Center of School of Leadership and Education Sciences at the University of San Diego, facilitated the Designing your Life and Career workshop held at the Writing Centre. The reasons we work and the meaning of life are topics that all and sundry deeply invest in. The importance of projecting one’s life in packs of five, ten, and twenty years cannot be underestimated as it helps an individual have goals and actively set out to achieve them. So why do we work? What has money got to do with it? What is the meaning of life? How do you find coherence in your work and life view? Students had a chance to ponder these questions during the Designing Your Life (DYL) workshop organised by Career Development Services and held at the Writing Centre. The workshop was facilitated by Dr. Peter Maribei who coordinates the Global Center of School of Leadership and Education Sciences at the University of San Diego. DYL is based on the creative thinking process of designers and leverages on proven design thinking principles used by leading companies such as IBM and Apple. To illustrate this, Steve Jobs, co-founder of Apple Inc., while tasking designers to create the iPhone, did not specify the type of gadget and apps that would be featured in it. He said instead that he “wanted to create something that was so instrumental and integrated into peoples’ lives that you’d rather leave your wallet at home than your iPhone”. Designers have a variety of ideas which allows them to choose those that are the most viable in order to focus on the few that will give birth to a best-selling creation. This process, when it comes to designing life, involves reframing dysfunctional beliefs, such as ‘you should know where you are going by now’; a belief that can paralyse those who are still in the process of mapping out their lives. By reframing it, one realises that it is never too late to design your life and that now is as good time as any to do it. An exercise within the workshop involves creating three versions of one’s future based on three scenarios: How will the next five years be using the circumstances you are in now? How different would it be if you encountered a major setback such as losing the job you have now? What if you had all the monetary resources at your beck and call; how would you design your life? DYL has given the students actionable tools necessary for becoming unstuck and creating a more meaningful life by learning how to ask the right questions, eliminating old ideas that are not working and testing new approaches to their life.